Over a medium heat toast the caraway seeds in a large heavy casserole dish until fragrant. Melt the butter with the seeds. Add the lardons to the pan and gently fry until browned then add the onions, carrots and thyme and continue to cook until all are soft and the onions and carrots are just beginning to colour (about 10-15 minutes). If using the wine add now and then totally evaporate it. Add the sauerkraut and grate in the apple, stir all together well. Add a good grind of black pepper and cook gently, stirring often, for 15 minutes or so. Stir in the cream if using. Season with salt. While the sauerkraut cooks put a pan over a medium heat and add a little sunflower oil. Season the pork generously with salt and pepper. Put the pork in the pan. It should sizzle immediately if the heat is right. Adjust the heat if needs be so as not to burn the oil or meat. Fry the loin for four to five minutes on each side or until desired. You want to achieve a deep rich golden brown colouring on the outside of the meat, then rest for 5 minutes. 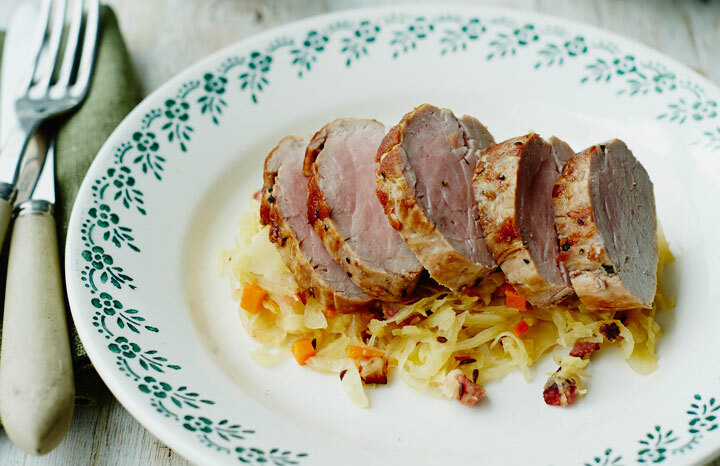 Slice the pork and serve on top of the sauerkraut. Plenty of Dijon mustard is the perfect condiment for this dish.